For a few years many Taiwanese students have been buying books from China, in particular cheaper translations of foreign technical textbooks. What started as a cheaper option for students eager to save money has turned into a normal part of book selling in Taiwan. 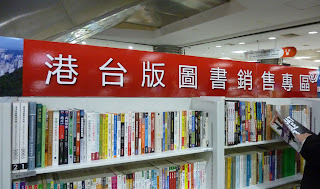 Indeed, mainstream Eslite bookstore chain among others has a dedicated floor in many of its recently opened branches, emphatically called "books in simplified characters." Of course all of these books come from China but most bookstores shy away from emphasizing the geographical nature of these publications. One has to remember that only two decades ago, any book from China was totally banned and that it would have been enough to be found in possession of a Chinese book to be arrested under martial law. In practice many innocent foreigners having brought dictionaries from Mainland China never encountered any problem. 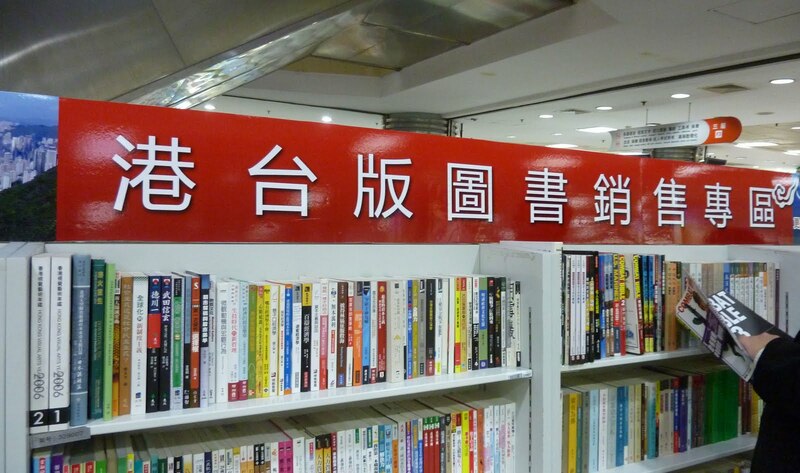 Recently, in a similar "Alice in Wonderland through the mirror view," some Chinese bookstores have started stocking up on books from Taiwan and Hong Kong. 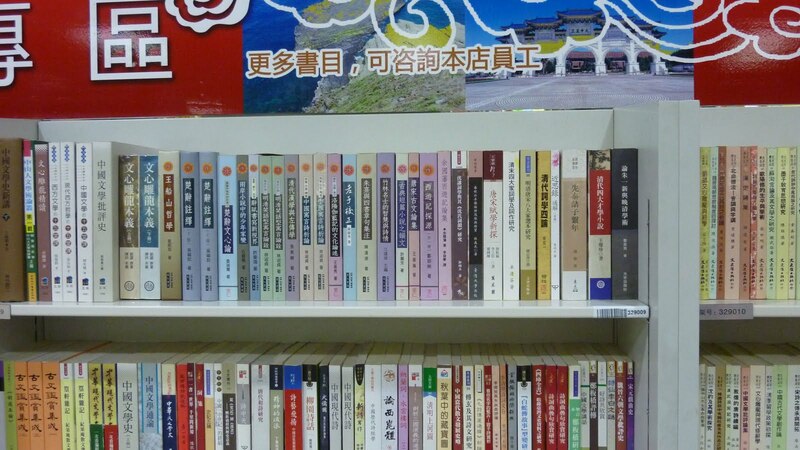 Wangfujing Bookstore has a dedicated section of such books. Considering that the "Law of the People's Republic of China on the Standard Spoken and Written Chinese Language (Order of the President No.37)" explicitly says in Chapter 1, article 1 that it "is enacted in accordance with the Constitution for the purpose of promoting the normalization and standardization of the standard spoken and written Chinese language" and that article 2 clearly states that normalization means the standardized characters (so-called simplified): "For purposes of this Law (...) the standardized Chinese characters." Articles 4 declares that authorities at various levels shall "take measures to popularize Putonghua and the standardized Chinese characters." The Wangfujing bookstore being in the hands of Xinhua is, at least in spirit, breaching the law; not necessarily a bad thing. Naturally the selection of books, mainly from Taiwan, is still fairly limited. What is noticeable is that it is done with aplomb going to the point of producing promotion material. This has hardly been noticed in the Taiwanese media. a non-event. This comes at a time when Internet censorship on Chinese Language sites is intensifying. It is not clear what criteria are applied for blocking one site or another. All English Language newspapers from Taiwan, including government sponsored sites, are freely accessible from Beijing; including the Taipei Times and the China Post. On the other hand many, but not all, Mandarin Chinese publications are blocked. Attempts to read the China Times 中國時報 or the Liberty Times 自由日報 are greeted with the notice that "the connection has been reset." At the same time on line papers such as Nownews did not provoke the ire of the censors. Many Wikipedia Chinese language pages could be accessed quite easily. There are dissenting views about whether there are two factions within the Chinese government, one being more liberal than the other. We can only speculate what brought about this timid liberalization on the printed word while more stringent controls are being enforced for electronic material. In the meantime, many customers were clearly interested in the books being on offer. 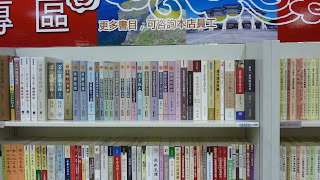 One particular type of books was still missing: I could not see any travelling guide to Taiwan. Surely, with individual travel opening up for Beijing and Shanghai residents, this could have been a red-hot item. China Internet observers have now taken to taking shots of articles on Chinese websites with the knowledge that articles routinely disappear. Ai Weiwei was arrested, disappeared for 48 hours before Chinese authorities reluctantly and indirectly admitted to his arrest. They then proceeded to charge him with economic crimes. Maybe they thought that if they could not charge him with subversive arrests they could trump up charges that, so they thought, would be justified. They then could claim that he was a mere corrupt profiteer. The inventive charges must have come from watching too many Al Capone movies: if you can't prove Al Capone is a gangster, charge him with tax evasion. How naive! Ai Weiwei is not only innocent, but his activities and personality do not fit the crime. It's a new record: some faction of the Chinese leadership has managed to make two politically immature mistakes in only 72 hours. First, they did not realize that the last person to arrest was Ai Weiwei. His disappearance brought immediate condemnation from many foreign governments, including the Taiwanese Mainland Affairs Commission and the DPP, albeit the MAC was a bit slow off the mark. This brought into focus the spate of "disappearances" over the last two months. Many sites, which had published comprehensive lists, with location maps, of bloggers, journalists and writers who had been arrested and held incommunicado all over China as a probable knee jerk reaction to the Jasmine revolution in Tunisia, were linked to twitter messages. This has highlighted the increase in arrests since the revolution in Tunisia and the consequent paranoiac fear inside the Chinese government of similar events in China. The second mistake was then to believe that economic charges would be believable and accepted at face value for his arrest. It does appear that some soft-liners managed to convince the hard line faction that accusing Ai Weiwei would not stick and come out as a ridiculous and feeble attempt to smear an otherwise well considered and honest artist. They were right: unfortunately they did not stop to think that removing the articles would have a worse effect than leaving them untouched on web sites. Don't China's Internet Bamboo Wall know that Internet users know what to expect of Chinese authorities and are careful enough to take screen shots on a regular basis? Some leaders are still in another time dimension and have a simplified view of the digital age. The electronic bamboo wall is increasing been torn down and all past activities can be recorded. The Chinese leaders must have realized by now: their primeval panic has brought upon them the worst punishment of all: they have made themselves lose face. Possibly the most terrible thing that could happen to faceless bureaucrats; for they are bureaucrats not politicians, they have lost all sense of politics, good or bad. 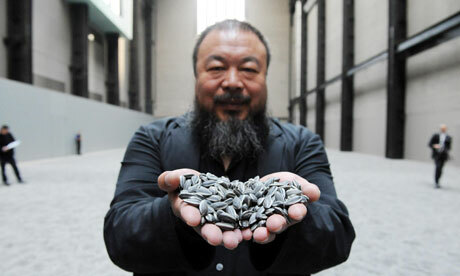 Ai Weiwei holds some of his 100 million 'Sunflower Seeds'. Image from artlet-blog.com. Ai Weiwei had disappeared for the last 48 hours after his arrest in full view in Beijing airport. The world media have been clamouring for his release along with many governments. Will they be listened? Fear of change often provokes political autism. There obviously is a struggle between the hard liners in the Chinese Communist Party who have, too quickly, childishly even, pressed on the panic button and the softies who had been multiplying speeches on the necessity to look at concepts like democracy with optimism. Were these speeches just for international ears? It appears that the hardliners are winning, for now. If change comes to China, it won't be in the same fashion as in Tunisia; but like Tunisia, it will be unexpected and from unforeseen quarters. Repression hasn't managed to re-invent itself but dissent always finds new ways to come through. Similarly, the Great Internet Chinese Wall is becoming old and cracked. Many Chinese blog on twitter and even sign the petition asking for Ai Weiwei's release. If more and more Chinese manage to go through the cracks of the internet bamboo wall, it means that even China with its thousands of internet watchers will not be enough to stop popular demand for a new modern way to govern China. *Ai Weiwei was due to work on an exhibition in the Taipei Fine Arts Museum.